How Old Can a Guy Be Before MLB The Show Finally Throws Him Out? Jamie Moyer, at 49, is scheduled to start tomorrow for the Colorado Rockies. Only 11 other pitchers have appeared in an MLB game at age 46 or older. 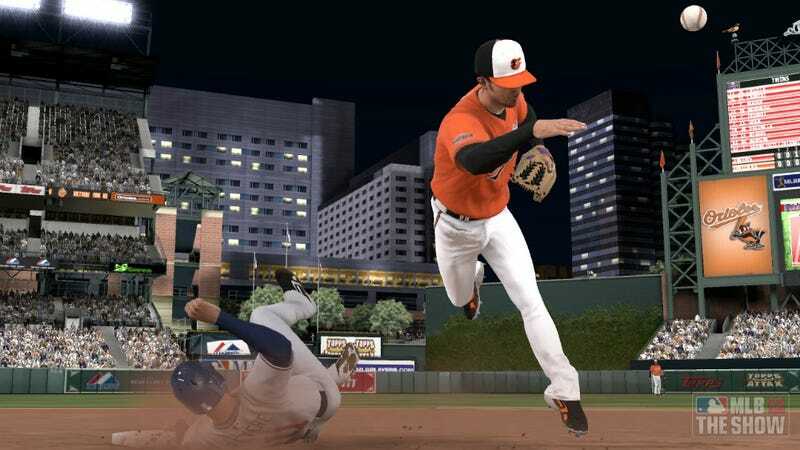 I was curious, how does a simulation like MLB 12 The Show, which prides itself on authenticity, handle age in its Road to the Show career mode, and in its multi-season Franchise and Season modes? Sony San Diego, which makes the game, was happy to answer the burning question. Aaron Luke, senior designer, says MLB The Show generally caps player age at 45, with rare one-year exceptions to 46. Though players retire younger in the simulation all the time, should a player reach 45 or the rare 46, they will be forced into retirement. "This carries through in all of our game modes." So it affects created players (the oldest age you can assign to a created player is 45), the randomly generated minor leaguers, and actual major leaguers alike. "We don't distinguish positions for this rule," Luke said. Of major leaguers 45 and older who have appeared in a game, half have been pitchers, and half have been position players. However, before Julio Franco's incredible 2007 appearance at age 49, the game hadn't seen a 45-year-old position player since Carlton Fisk in 1993. On the other hand, Tim Wakefield, Roger Clemens, Randy Johnson and Jesse Orosco have all appeared on the mound at that age or older in the past 10 years, so there's the perception that pitchers can last longer, no doubt because they don't pull everyday duty. "There is a difference for the actual MLB players versus the generated or created players in that, if there is an active MLB player above that age, they will obviously be included in our rosters," Luke said. "The likelihood of that player continuing on in your Franchise past year one is pretty low because be above the age of which we prefer to retire players." Unfortunately, I couldn't test this out because the most recent roster update, on Monday, did not bring Moyer (pictured) with it. However, Omar Vizquel, at 44, is on the Toronto Blue Jays' roster, and will turn 45 on April 24. In my season simulation, he appeared in 100 games, committed no errors over 224 chances, hit .239 and even a home run, which I think might be a record for oldest by a shortstop. And then, sure enough, the game retired him —-and also Yankees closer Mariano Rivera, the league leader in saves for this sim. I have never seen Rivera, 42, survive past the 2012 season in any MLB 12 The Show simulation. Tim Wakefield, though retired in real life, is available in the free agent pool of Season and Franchise, and all he has is a season left in this game. If you want one last chance to play with Boston's venerable knuckleballer, this is it. "We do diminish a player's ability based on his age as well, so a player in his late 30s or early 40s, in all likelihood, will not be able to stay competitive against the younger MLB competition," Luke said. Correction: A previous version of this story said Moyer would become the oldest pitcher to start a major league game. Satchel Paige holds that distinction. Moyer is the oldest to have started a major league postseason game. Have a burning question about a sports video game? Send it to me and I'll see if I can get an answer.